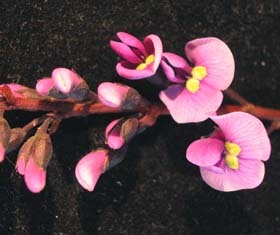 Hardenbergia violacea is a very common garden plant that has escaped and become established in many places. However, two small populations eastern Tasmania seem to be native. It is a scrambling plant with large leaves and prolific purple flowers in spring. The most common cultivated plant is the variety Happy Wanderer.